Many of my favorite routers over the past three years have borne the Netgear brand. 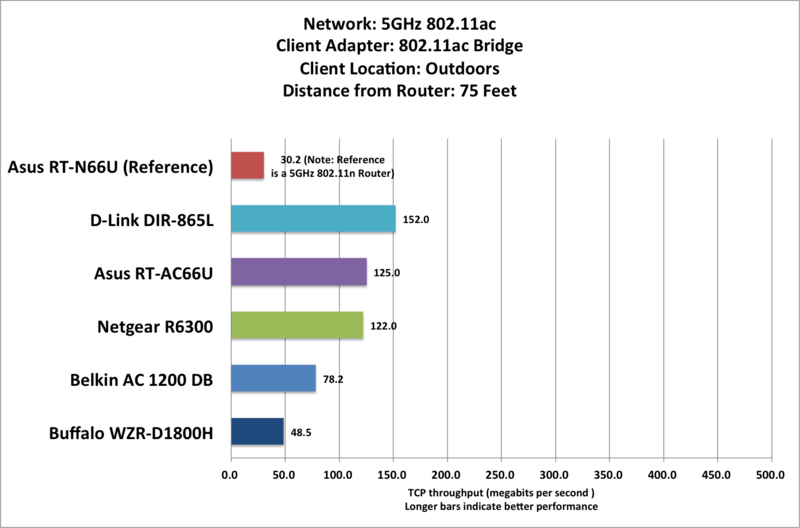 The company's first 802.11ac model, the R6300, is an excellent router, too. But in my tests, the Asus RT-AC66U proved to be just a little better. 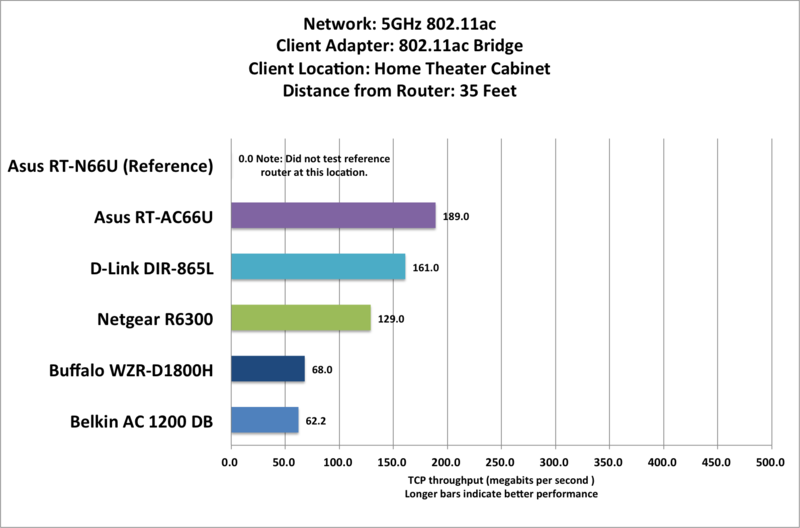 The R6300 looks very different from Netgear's other routers, including the previous top-shelf WNDR-4500. The R6300 has a broad face that reclines back on its base, whereas the routers in Netgear's WNDR line stand straight up and present a narrow profile to the user. Both have internal antennas, and neither can be wall-mounted. The glossy black plastic enclosure is a fingerprint magnet, so you'll want to avoid handling it once you've set it up. The R6300 is a concurrent dual-band 802.11n/802.11ac model, delivering three spatial streams on the 2.4GHz frequency band with maximum theoretical throughput of 450 megabits per second, and another three spatial streams with maximum theoretical throughput of 1.3 gigabits per second on the 5GHz frequency band. Would Netgear's R6300 router perform better if it was equipped with external antennas? Netgear isn't manufacturing a media bridge; instead, the company recommends that consumers obtain two R6300 routers and configure one as a wireless bridge. That's what I did for this review. The R6300 comes with two USB 2.0 ports to support sharing a network-attached USB storage device and a USB printer simultaneously. I didn't test printer sharing, but the router turned in a solid performance on the storage front. 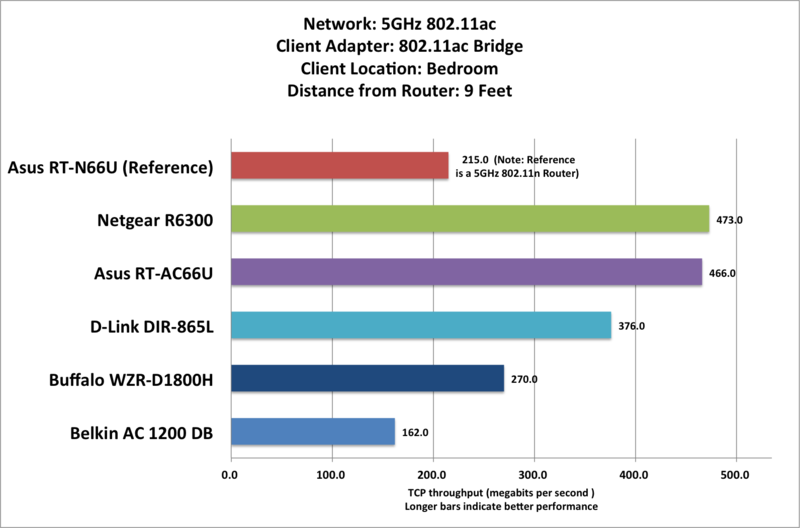 The R6300 doesn't offer quite as many features as Asus's 802.11ac router. It comes with a DLNA-certified media server, built-in Samba and ftp servers, and parental controls via OpenDNS (much like the D-Link DIR-865L); but it lacks an iTunes server or VPN pass-through. Like the RT-AC66U, the R6300 does provide guest networks on both bands (Buffalo's WZR-D1800H doesn't provide a guest network at all). I used an AVADirect laptop equipped with a 2.5GHz Intel Core i5-3210M CPU, 4GB of memory, and an integrated Intel Centrino Ultimate-N 6300 Wi-Fi adapter to run my benchmark tests. The Ultimate-N 6300 can send and receive three simultaneous 150-mbps spatial streams (450 mbps in total); most adapters are limited to handling two (300 mbps in total). This was all the streaming I needed to evaluate the Netgear's 802.11n performance (on both the 2.4GHz and 5GHz frequency bands). To measure the router's 802.11ac performance on the 5GHz frequency band, I configured a second R6300 as a wireless bridge and connected it to the AVADirect's ethernet port. To test the router, I positioned the client successively at five spots inside and outside a 2800-square-foot, ranch-style home (distances from the router are noted in each chart below). I used the open-source IPERF benchmark (and the JPERF Java graphical front end designed for it). To measure the router's downlink TCP throughput, I set up the laptop as a server and used a desktop PC hard-wired to the router as the client. The R6300 finished in first or second place in most of my test locations, and it delivered impressive wireless TCP throughput of 473 mbps in the bedroom, where the client is in the same room, just 9 feet from the router. The Netgear router's performance dropped slightly, to 432 mbps, when I moved the client and bridge to the kitchen, which is 20 feet from the router and separated by one wall. The Asus RT-AC66U performed better in this location than it did in the bedroom, and captured first place on this measure. The next two benchmark runs took place inside my home theater. This is a room-within-a-room design, with four walls of 2-by-4 framing and drywall inside four walls of 2-by-6 framing and drywall, with about 6 inches of dead air and fiberglass insulation separating them. My intent was to optimize the room's acoustics, not to build a Faraday cage, but many lesser routers and other wireless devices have had trouble penetrating it. However, none of the 802.11ac routers I tested had any difficulty reaching the client in this room. 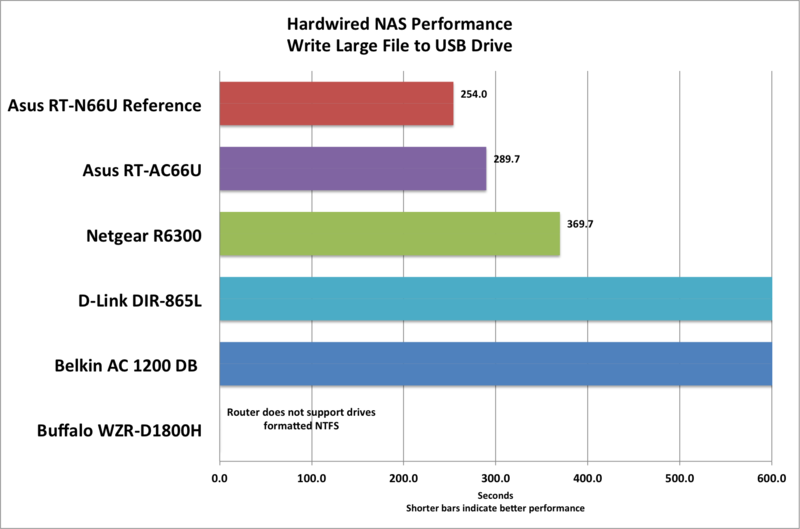 The R6300 managed to perform just a wee bit better than the Asus RT-N66U and the D-Link DIR-685L to earn a first-place finish here. Since many people will want to connect the gear in their home entertainment system to an 802.11ac network, I decided to measure TCP throughput with the wireless bridge inside the built-in equipment cabinet in my home theater (the floor-to-ceiling, wall-to-wall cabinet is constructed from cabinet-grade plywood, including the back). The R6300 took a much bigger hit in TCP throughput performance at this location than did the other two routers I just mentioned, with wireless TCP throughput dropping down to 129 mbps. I suspect that the orientation of the wireless bridge is responsible for this. When it was sitting on the coffee table in this room, it obliquely faced the router. When it was in the cabinet, it was perpendicular to the router. Still, the R6300 delivered enough bandwidth to allow me to wirelessly mount and stream a Blu-ray ISO image of the movie Spiderman 3 from a Windows Home Server 2011 machine in my home office to a home-theater PC in that entertainment center, including the movie's high-definition multichannel soundtrack. 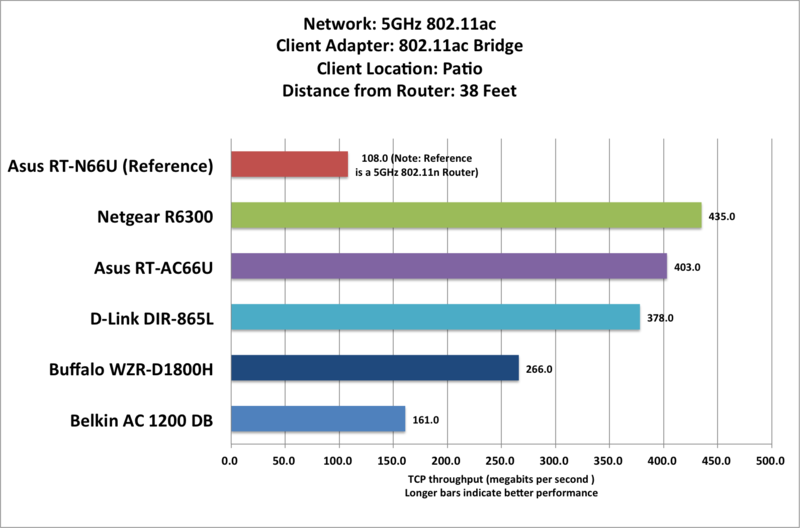 The R6300's performance bounced back when I moved the client and the media bridge to the first of my two outdoor test locations, an exterior patio enclosed by three walls and one half wall with glass windows. The signal from the router travels a more direct path to this location, even though it must pass through two insulated walls. In the real world, I doubt that anyone would try to set up a media bridge outdoors because dragging the bridge and finding an outlet (and likely an extension cord) are too inconvenient. The R6300 performed slightly better here than it did in the kitchen, delivering wireless throughput of 435 mbps for a first-place finish at this location. TCP throughput dropped to 122 mbps when I moved the client and bridge to my second outdoor test location, a picnic table 75 feet from the router with four insulated walls in between. That data transfer rate was only good enough for a third-place finish on this measure, but achieving such high throughput that at so distant a range is pretty amazing. Most 802.11n routers operating on the 5GHz frequency band can't reach the client at all here (the Asus RT-N66U being a notable exception). The R6300 delivered a middle-of-the-road performance on the 2.4GHz frequency band, but it was twice as fast as D-Link's DIR-685L when I moved the client to the farthest test distance from the router. Both devices can deliver perfectly acceptable performance for Web browsing here, but the Netgear is much quicker when transferring files across the network. 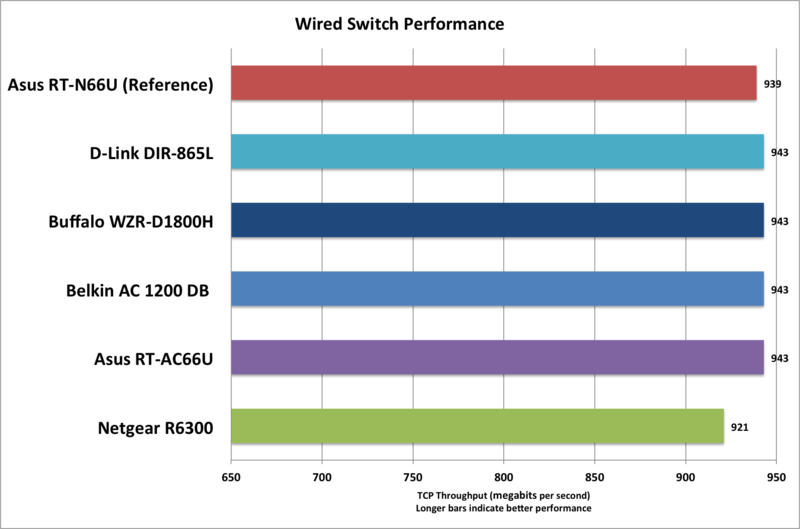 Netgear's R6300 lagged slightly behind the rest of the field with the client hardwired to its four-port gigabit switch, but the difference was negligible. To evaluate the R6300's performance as a network-attached storage device, I connected a 500GB Western Digital My Passport USB drive to one of the router's USB ports. I used a stopwatch to time how long it took the unit to copy a few files from a PC to the drive over the network (a write test), and then I copied a few files from the USB drive to the networked PC over the network (a read test). The PC was hardwired to the network. I created a large-file test by ripping a DVD (Quentin Tarantino's From Dusk to Dawn) to the PC's hard drive. Copying this 4.29GB file from the PC to the portable hard drive required slightly more than 6 minutes, while reading it from the drive required a little less than 7 minutes. These scores put the R6300 in the middle of the pack on this benchmark. I couldn't test the Buffalo WZR-D1800H on this measure, because that router recognizes only drives formatted in FAT32 or XFS. Unless you rip a lot of movies from DVD or Blu-ray discs, you'll rarely move a single large file to a hard drive attached to your router. A more common task is to move batches of small files back and forth across your network. To evaluate each router's performance in this scenario, I created a single folder containing 595MB of small files (subfolders containing music, graphics, photos, documents, spreadsheets, and so on). 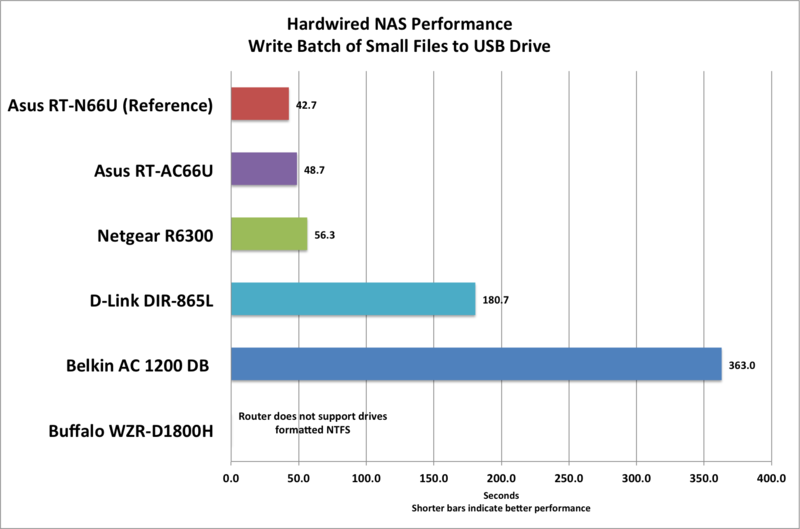 The Netgear R6300 was very quick at writing this batch of small files to and reading them back from the attached USB disk drive, performing each tasking in about 1 minute, as the charts below indicate. 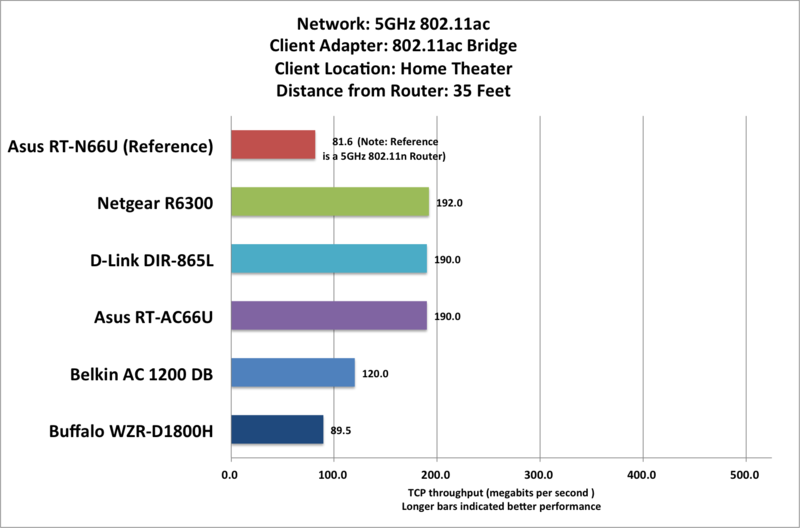 In the competition for the title of best 802.11ac router on the market today, Netgear's R6300 finishes a very close second to the Asus RT-AC66U. It's not quite as fast as the Asus in most benchmarks, and it doesn't offer as many features as the Asus does. The performance gaps, however, are not huge. The one area where Netgear has a leg up on Asus is in apps. Install Netgear's Genie app on your smartphone, and you can use it to monitor and manage your network. Asus was getting ready to launch their AiCloud service as I was wrapping up these reviews, however, so Netgear's advantage may be short-lived. And Netgear will never be able to overcome the RT-AC66U's removable, upgradable antennas. Note: This review is part of a roundup. Click here to read the introduction to the story and find links to the other 802.11ac routers reviewed at the same time. 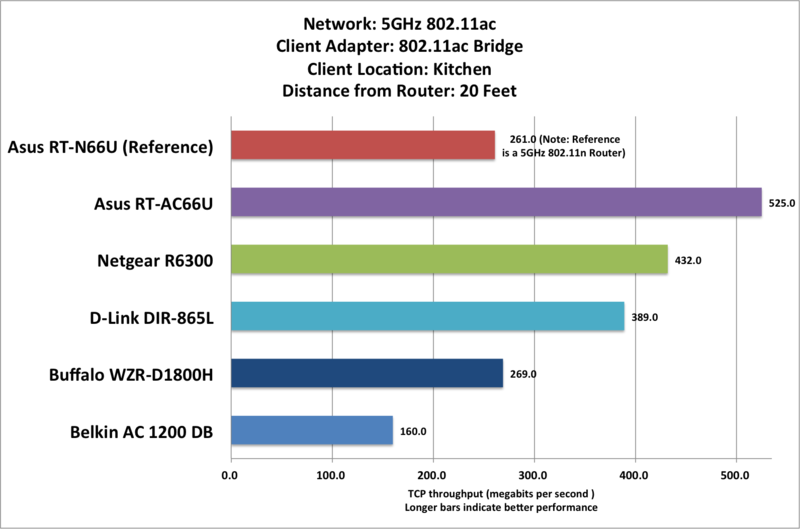 Netgear's R6300 is an exceptionally good router, but it's not better than the Asus RT-AC66U.